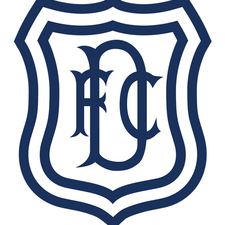 The lack of transfer activity at Dens is depressing. An article in yesterday's Guardian that prompts delicous memories of Caniggia, Ravenelli, Ketsabaia et al, yet leaves a sour taste in the mouth with the shame of administration. What’s the latest with the new stadium? Are there still access issues? I see that plans now include a new crematorium! I’m tempted to make a witty remark but a) I am not witty and b) it’s probably something that would benefit the city. It's a bit strange that no one has answered my question though. 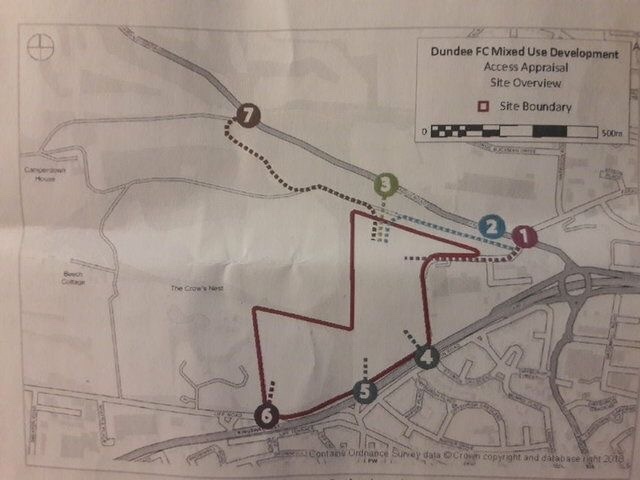 Given the amount that all you Funsters seem to know about what's happening at United I thought you'd have some indication as to how the stadium plans for your own club were developing. Initial consultation stage has closed and they are timetabled to submit a formal planning application sometime between now and the next couple of months. Hotel rights apparently been discussed with a chain who are interested. I thought the access was the big stumbling block. Have a look over this to kickstart your Friday night, GD. I've heard rumours of proposals for various modifications and at the consultation event, they had some drawings which showed a few changes (traffic lights, extra pedestrian access, overpass etc - the pedestrian drawing is on the image above). You may well have heard something I haven't but I'm not aware of anything major right now, there was a bit of questioning about access when the project was announced but that was just a few people curious about how it would work. The fact you were months behind with your information renders it worthless. New access routes directly from the kingsway just a couple of hundred yards up the road from the BP garage. New road layout required for the exit at the bottom of the timex brae. Traffic lights instead of the current roundabout. Only stumbling block is apparently 3 trees that Dundee would prefer down. These can be left standing if required because they lie between where the stadium is planned to go and the crematorium. Upmarket hotel chain pretty much signed up for the 100 room hotel and Tesco metro taking 1 of the shopping outlets available. That’s you chased Granny D off for the evening K.T. Well played you fellow Dee's. That should be the end of the geriatric smart arse. It would be but you get used to not having any. Celtic or Aberdeen if we get through! Good interview by our manager on the stv news tonight. Saying there’s been plenty of interest in Hendry but no bids that make us sit up and take notice. Said we are trying to build the club and the players are aware that we aren’t just about to let them walk out the door unless there’s a good offer placed for them. Let’s hope Keyes and Nelms are on the same wavelength. DAB's at Dens again would be good if we progressed. Then we can dish out more punishment. Thank you.